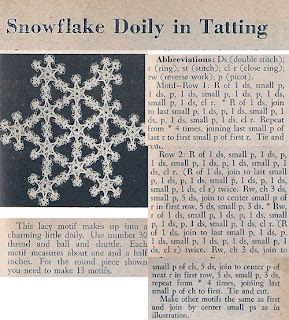 This pretty little snowflake a tatting motif. Take the pattern and make them up to your heart content. Then, put them together to form doilies, chair sets .... whatever you desires (within reason, of course). This delicacy is from the October 1953 issue of The Workbasket. I hope someone will put it to use ! I most certainly will. Thank you for posting it!